The content analysis tool in the Yoast SEO plugin assesses many aspects of the articles you add to your website. Working in real time (so you get feedback as you write), it checks how SEO-friendly and easy to read your content is. This post goes through the most important features of the content analysis tool and how to use and interpret the feedback it gives you. Beware: content comes before SEO! Step 6: Check your SEO bullets! 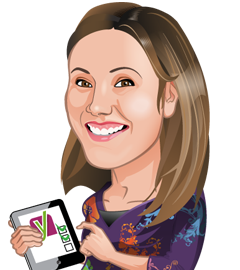 The Yoast SEO interface consists of several collapsible headers — meaning you can click on them to open or close them. Today, we’re focusing on the Readability header and the header that reads Focus keyphrase. The latter contains all the SEO checks, many of which are based on the focus keyphrase you enter in the relevant field. If you write a readable text, based on the criteria above, the plugin will reward you with a green bullet. 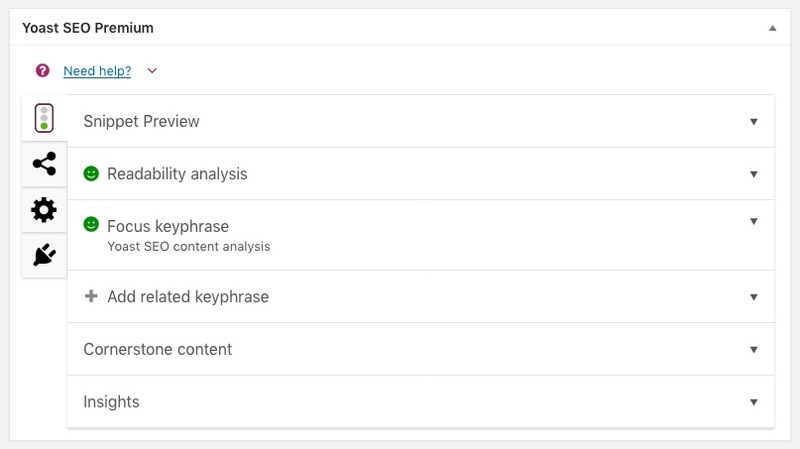 The Insights tool checks the words you use most often in your article, helping you to see if your text actually matches your chosen keyword. Your focus keyword should appear on this list. If it doesn’t, you might want to rework your article or even add a second focus keyword with Yoast SEO Premium if necessary. The second part is the SEO analysis, where you’ll find the snippet editor, the field for your focus keyphrase – and various other SEO checks. The snippet editor allows you to create your meta description, which should be a short piece of text describing the main topic of your piece. If your meta description includes the actual term people search for, that exact text will be shown by Google below your URL in the search results. But often Google automatically generates a meta description, because, sometimes, Google knows best. Yoast SEO also checks for links and images in the article. The plugin calculates the number of words and frequency of the focus keyphrase in your article. The plugin also checks whether you’re using the exact same focus keyphrase on other pages of your website so you don’t accidentally compete with yourself. In addition to this, Yoast SEO Premium checks how you distributed the keywords on your page. You can no longer mention your keyword in the intro a couple of times and still get a green bullet. Your article should contain your focus keyphrase or its synoyms evenly throughout the text. If you were to optimize two different articles for the same focus keyphrase, you could have both posts turn up in the same search on Google. Read why you shouldn’t use your focus keyphrase more than once. If you write a relatively SEO-friendly article — based on the above criteria –, the plugin will reward you with a green bullet. Incidentally, some people call them green lights, but we prefer to say bullets. If you follow the instructions and craft your pages and posts so they get green bullets, they have a better chance of ranking in search. But what if you have all green bullets and still no rankings? In the content analysis tool, content comes before SEO, so first and foremost you have to write awesome content. Put your effort into writing an attractive, structured and readable article and then use our content checks to make sure your text is nice and easy to read. Once you’re done optimizing your text for readability, look at the checks on the SEO analysis tab. If you’ve done your keyword research properly and you’ve written your post or your article with a focus keyword in mind, don’t change it now! Why? See The temptation of the green bullet to find out. WordPress has a distraction-free writing mode that enables you to write in the WordPress backend without being distracted by the menu, the toolbar, the categories box, etc. You can write your article directly into the backend of WordPress or write in any text editor and copy and paste it into the WordPress backend. Either way is fine! If you choose to paste your text into the WordPress backend, copy without any formatting. This is because all the formatting should be done within WordPress to avoid layout compatibility issues carried across from another program. Make sure you set subheadings to heading 2, sub-subheadings to heading 3, etc. Then put the title of your post – your heading 1 – in the title box. 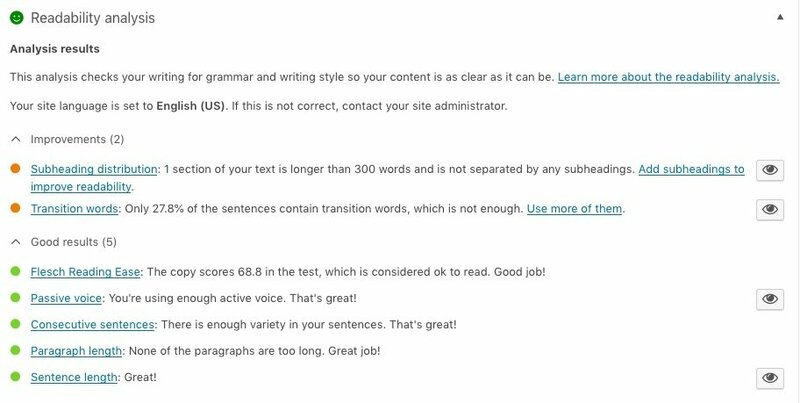 Click on the readability analysis tab and you’ll see your scores for the readability checks. The green bullets show which aspects of your content are good, while orange and red bullets indicate where you can make improvements. Clicking on the little eye will highlight the sections where the analysis identified a problem. These content checks will help you make your article easier to read. Make sure that the overall bullet — the one on the upper right in the backend of your post — is green. The overall bullet will turn green if you have covered most of the readability aspects. The readability analysis checks tell you where your article’s readability could be improved. Some of these issues will be easy to fix. If you tend to write long sentences, our analysis will tell you which ones to rewrite. Split long sentences up into shorter sentences. If your paragraphs are too long, divide them up too. 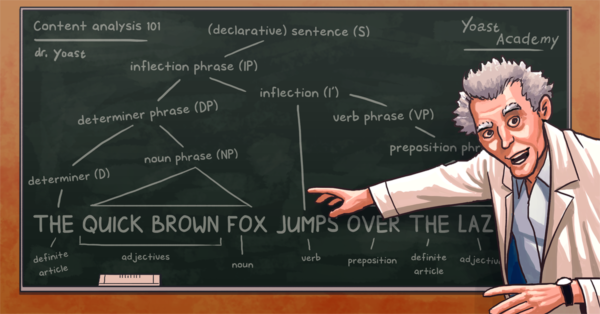 If you use a lot of passive voice, rephrase a few sentences. Add extra subheadings if the analysis tells you that your subheading distribution isn’t optimal. If your text scores any red bullets on transition words or Flesch Reading Ease, making improvements will be more difficult. Your Flesch Reading Ease score will improve with shorter sentences. In addition, you should also check whether you have used too many difficult words (words of more than four syllables). Are there shorter, simpler alternatives you can use? Transition words aid readability. If the analysis suggests you add more, you can improve things by adding them – but don’t just throw them in at random. Look at the structure of your text and decide where transition words will work. Which words would make the relation between paragraphs — and between sentences — clearer to your readers? Perhaps you make some points that can be listed numerically, so you could add transition words like ‘firstly’, ‘secondly’ and ‘finally’. And maybe you could add transition words in your conclusion as well. Could you use words like ‘summarizing’ or ‘therefore’ in your final paragraphs? Once you’ve finished optimizing your article’s readability, move on to the SEO analysis. Click on the focus keyphrase tab and enter your focus keyphrase — the keyword you want your post to rank for — in the appropriate field of the Yoast SEO metabox. This should be a keyphrase which came from your keyword research and which you kept in mind throughout the writing process. 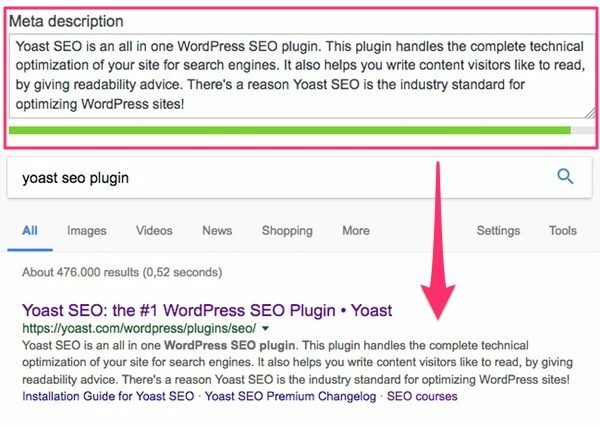 Yoast SEO Premium lets you optimize an article for more than just a single focus keyphrase — you can now add synonyms and related keyphrases as well. Optimizing your post for multiple keyphrases lets you to rank the same content for more keywords and to get more traffic to your site. Enter the meta description, describing clearly what your post or article is about. And make sure you use the exact phrase used in your focus keyword. The meta description will be shown by Google below the URL if people search for your focus keyword. The meta description should include your focus keyphrase, not because it will improve your rankings, but because otherwise Google usually won’t display it in the search results. Google will always try to match the search query with the description. If the focus keyphrase isn’t mentioned in the meta description, Google will just grab a random piece of content containing the keyphrase from your page instead. While there’s no ‘penalty’ for having meta descriptions that are too long, it’s still a good idea to keep them short if you can. You should make sure that: 1. it fits the character limit and; 2. it still makes sense when it’s cut in half, and still entices people to click. Now check out those SEO bullets! Again, green tells you which aspects of your SEO are good, while orange and red indicates where you can improve your SEO strategy. However, you don’t have to keep on optimizing until all of the bullets are green. Posts on Yoast.com often have a few orange bullets and sometimes even one or two red ones. The important thing is that the overall bullet (the one on the upper right in the backend of your post) should be green, which happens if most of your SEO aspects are covered. The checks in the SEO analysis will show you where you can improve your SEO. Look critically at your title, the headings, and subheadings of your article. Do they include your focus keyphrase? If not, can you edit them (without changing the structure or content of your article) to include your focus keyword? Don’t go crazy and put your focus keyphrase in every heading, because that’s too much! Using your focus keyphrase in one heading and your title should be enough. You can read more about headings in one of Michiel’s posts. Your article should also include the focus keyphrase a couple of times, and if it’s not in your first paragraph, add it. As a general rule of thumb: try to use your search terms in about 1 to 2 percent of your text. Say your article has 300 words, you’ll need to mention your search terms 3 to 6 times. That’s not to say 300 words, or the number of keyword mentions is an exact goal. However, 300 is the minimum length for an article that needs to show authority. 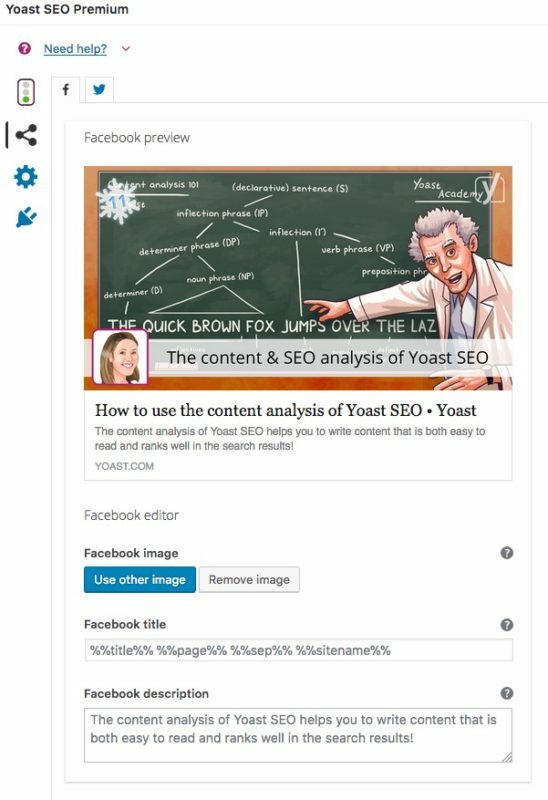 The final step in the Yoast content analysis tool is to add the social data for your article. Any description or title you add on this tab for use by a social network will be shown in the metadata for the page. This means that this description, title or image will be shown when the page is shared on a particular social network. These descriptions have the same requirement as the meta description (which is what they fall back to), but can usually be longer. They should tell people what to expect and why they should click. The preview screenshots on the left are taken from Yoast SEO Premium, in the free version, you won’t see those previews, just the fields! Because your cornerstone articles should be the best articles on your site, and you want them to rank high in the search engines, Yoast SEO provides a specific cornerstone content analysis. If you mark an article in Yoast SEO as cornerstone content, the content analysis will be a little stricter — your article will need to be longer, for example. You can also check if these articles are linked to often enough elsewhere on your site with the text link counter in Yoast SEO. SEO copywriting is still hard work, but the content analysis tool in Yoast SEO makes the process of writing awesome, SEO-friendly articles much easier. For more practical tips, make sure you read SEO copywriting: the Ultimate Guide. We are continually working on more checks to add to our content analysis, so stay tuned!